Specially formulated to give you clear, problem free skin, this scrub works with a dual exfoliation and purifying action. Neem well known for its purifying action. Neem is well known for its purifying and antibacterial properties, kills problem causing bacteria. Combined with exfoliating apricot granules, it gently scrubs away blackheads, dead skin cells and embedded impurities, leaving your skin, soft, clear, refreshed and problem free. 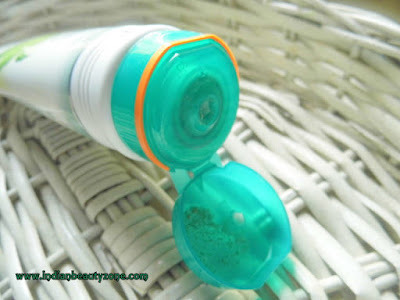 It comes in a white tube with a green flip open cap which is easy to handle and to carry with you around while travelling. You can get smaller sizes also. The Texture is creamy with grainy particles of apricots. The colour is light green and smells nice and good. 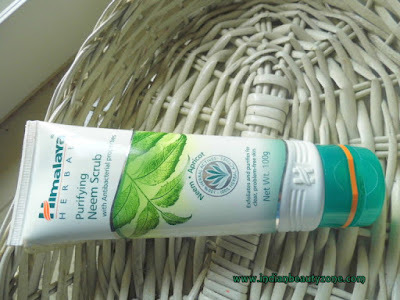 I am not using it regularly but using it when I want to put the neem face pack, it is because a strong hope of same formulated products will work together well. I feel always whenever I use this scrub I get some redness on my cheeks. I have sensitive skin so the apricot granules are bit harsh for my skin. Otherwise this scrub seems perfect for a normal skin people. This creamier texture helps you to scrub gently all over your face and neck without any much problem. It never gave dry fell for me after washing. It cleanse the dirts and dead skin cells from the face very well and gives a refreshed feel after every use. 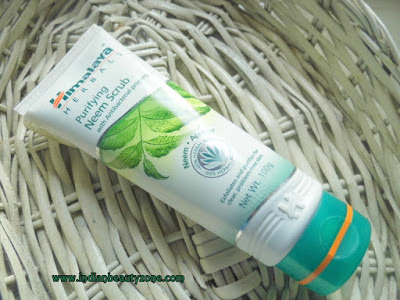 This scrub smell itself refreshing and best for using during summer for oily to combination skin people and of course it will be suitable for normal to dry skin people too. It really cleanse the unwanted oily substances from the skin which is very helpful for stay away from the ugly acne and pimples. Regarding blackheads it is not so effective. All over it is a decent affordable scrub to use weekly twice or once. It works well for dead skin removal. It helps to keep oiliness at bay. 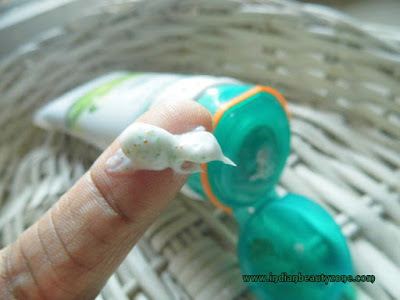 It is effective on acne and pimple when used with the Face pack. Also suitable for all skin types. Nice creamy texture never makes the skin dry. It gives mild redness to the sensitive skin. It didn't work good on blackheads. Himalaya Herbals Purifying Neem Scrub is a good decent scrub available easily at affordable price. it gives clean, soft and refreshed skin after every use. May be little harsh for sensitive skin.